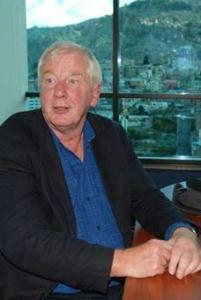 Nick Caistor is a translator, journalist and author of non-fiction books. He has translated more than 40 books of fiction from Spanish, Portuguese and French, including works by Paulo Coelho, Eduardo Mendoza, Juan Marsé, Edney Silvestre and Dominique Sylvain. He has twice received the Valle-Inclán prize for translation from Spanish, while his recent short biography of Che Guevara (Macmillan) was praised as ‘a biography of Che Guevara for grown-ups’. He has also published biographies on the former Cuban leader Fidel Castro, and the Mexican poet Octavio Paz (for Reaktion Books’ Critical Lives series). He has written a cultural history of Mexico City for Signal Books, and a history of Buenos Aires for the same publisher. As a journalist, he has presented and produced many programmes on BBC Radio 4 and the BBC World Service, and he contributes regularly to the TLS and the Guardian. Forthcoming projects include a guide to the Mayan world and an anthology of Spanish Civil War poetry. Nick lives in Norwich with his wife Amanda Hopkinson.